Reviews, stories, chat and miscellany from the amazing typing thumbs of a 13-year-old girl. You know those fairy tales you read as a child? Well, those aren’t real. Real fairy tales have bloodshed. Lots of it, and a certain girl named Jill and her cousin Jack who go looking for the Looking Glass. If they don’t find it? Death. In the story are Jack, a towns boy who gets teased because he traded his cow, Milky, for a bean; Jill, a princess, who happens to somehow show up naked to her own party; and a frog, named Frog, heart-broken because he was in love with a princess (who is now Queen). When these characters team up to find the Looking Glass, they must face many dangers, make some friends, and, of course, get the Looking Glass. Jack and Jill are approached by a mysterious older woman who tells them to find her lost Looking Glass or face death. Any wise person would agree to this, unless they do not enjoy their life. Anyway, there Jack and Jill go, no, not to fetch a pail of water, but to face beasts. Maybe even murder. Would you do this for your life? Yeah, Hi. Olivia here. I really liked this book because it was very different than any other book I have read. I don’t normally read books with bloodshed in them, but I have to say, this book was amazing (even though the bloodshed made me feel nauseous at moments). It was very well written, and I have to warn you, future readers, VERY detailed. This is not a book a child under my age should be reading. (It even gave ME nightmares!!) So, anyway, I give it five stars. 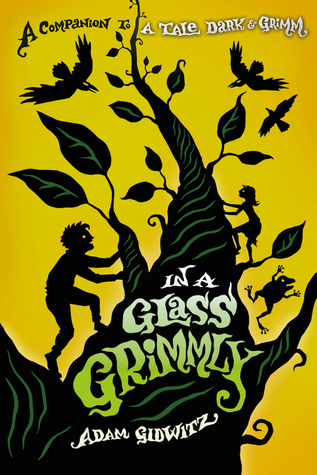 In a Glass Grimmly by Adam Gidwitz was published on September 27, 2012 by Dutton Juvenile. OhweewahFilmz is a middle-schooler, video-maker, writer and anime-obsessed girl. She also thinks Selena Gomez is the awesomest.